this hot sultry weather has made me nostalgic for the beach. so thought i would share some lovely white beach photos today. 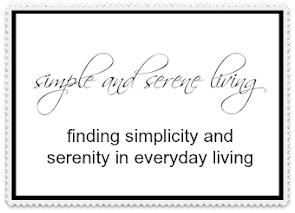 i think white evokes a feeling of coolness and serenity. this sweet beach cottage brings back lazy day memories of summer vacations by the sea. 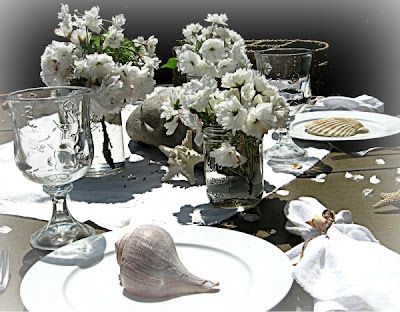 some simple white touches on a table. love this idea of painting some old worn luggage pieces white to place by your cottage bed. add a touch of whimsy to your cottage table with some white washed beach finds. 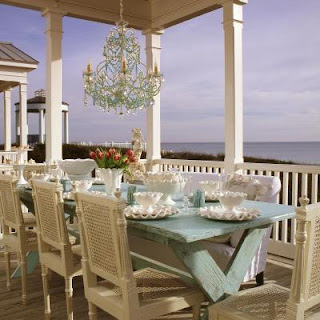 rustic charm combined with simple elegance makes for a perfect meal on an ocean front porch. i guess since i can't be at the beach right now, it's nice to dream of those days. i think i am going to search through my shells for some perfect finds. Thanks for commenting and following. I'm enjoying scrolling back through your posts and checking out your etsy shops. So many yummy whites. I love the pale blue table with all of the white. So beachy. I'm with you. If I can't be at the beach, I can sure dream about it! oh the living room! beautiful images, and i do agree that white is magical. i'm never bored by it! I just love how clean white is. I remember a great article by Rachel Ashwell where she said she loves all white slipcovers because there's nothing a little bleach can't solve. It really changed my opinion about white not being practical. Beautiful whites, Laura! I love those trunks and that deck...oh my! Absolutely divine! That's my idea of heaven on earth...a beautiful beach home smack on the edge of the ocean! Gorgeous whites, indeed! Every photo is wonderful and full of inspiration. What a beautiful post and inspiring photos!! I especially love the white suitcases!!! Thank you so much for visiting and leaving a sweet comment!! Your post made me wish I was somewhere cooler than Georgia right now. Sitting with an ocean breeze would be perfect. Have a wonderful day. Ahhh I love the whites- so soothing and light- Beautiful pic choices, as always! Hi Laura...so happy I stopped in from WW, your inspiration is beautiful! I'd love to be sitting under that chandelier right now!